Riders in the UK and in Ireland are up in arms about the EU Commission’s proposals for motorcycles. Protest demonstrations have been organised for the 25th September throughout the UK and Ireland. There are many issues of which riders have justifiable reasons to express their anger and concerns regarding these proposals. Right To Ride has aimed to provide clear and factual details of the progression of the Commission’s proposals and the discussions that have taken place within the Internal Market and Consumer Protection (IMCO) Committee. We have communicated to all the players in the Commission, Industry and IMCO expressing our views and concerns. Yesterday we received from Malcolm Harbour, Chairman of the IMCO Committee and Shadow Rapporteur for the European Conservatives and Reformists Group (ECR) a follow up email in relation to the Commission proposal for an EU Regulation on the approval and market surveillance of two- or three-wheel vehicles and quadricycles. “The amendments tabled by MEPs which are outside the scope of the Commission’s proposal constitute political recommendations which are very unlikely to feature in the adopted text. If however there is majority support for any of these ideas, the amendments concerned can only feature in Recitals to the Regulation which means they have no legal effect”. “Even if these recommendations make it through the Committee stage, which I doubt, both Council and Commission would resist them featuring in the final text of the Regulation as they have no corresponding Article. The amendments concerned relate to driver/rider training, side visibility reflectors, roadside random spot-checks, technical examinations of motorbikes and liabilities in accident situations, and the harmonisation of driver licence schemes”. “In the context of this draft Regulation, we are simply not engaged in a discussion on national debates concerning the mandating of high visibility jackets for riders, the banning of older motorcycles from urban areas, nor are we discussing EU funded research on throttle and speed control schemes. These are all considerations which are completely outside the scope of this legislative proposal. Furthermore, picking up on other concerns constituents have expressed, there are no proposals on the table about mandating the sealing of the power train from the air box or relating to setting a diameter and aspect ratio for the rear tyre”. “This proposal is currently before the European Parliament in first reading with the Internal Market and Consumer Protection (IMCO) Committee in the lead. The Committee vote has been put back to 17th October with adoption by the Parliament expected in December to ensure better alignment with progress made on the dossier by the Council of Ministers. Negotiations are about to start between the MEPs following the file in view of reaching a coherent set of compromise proposals on the amendments which were tabled. I would like to remind you that no decisions have yet been taken on the proposal by the IMCO Committee. The key areas where compromises will be sought concern the appropriate categorisation of All Terrain Vehicles (ATVs) and Quads, the timeline for introduction and degree of sophistication of On-board Diagnostic systems (OBD), the appropriate categorisation of Electric Vehicles and E-bikes, Endurance Testing, and the introduction timetables for EURO standards. I am sympathetic to some of your concerns about the legislative process in the European Parliament, but I would urge you not to panic and to have some faith in the MEPs working most closely on the file, whose common interest it is to draft good legislation, and who are working in consultation with experts to achieve this. Some disparaging allegations which have been made reveal just how unreasonably the work of the IMCO Committee – as well as the actual scope of the draft law – has been represented. Indeed, a number of amendments tabled by MEPs in other political groups are quite vague or off-beam, but in all of our Committee deliberations, if there is anything worth saving in the more questionable ideas, these are eventually redrafted properly and included into consolidated amendments which are checked by our European Parliament legal service, including on whether they are actually admissible. Moreover, especially on a technical dossier such as this one, irrelevant, inappropriate or unclear amendments tend not to survive the sift at Committee stage, let alone when we enter into negotiations with the Council of Ministers. Issues raised not relevant to this Regulation. The amendments tabled by MEPs which are outside the scope of the Commission’s proposal constitute political recommendations which are very unlikely to feature in the adopted text. If however there is majority support for any of these ideas, the amendments concerned can only feature in Recitals to the Regulation which means they have no legal effect. Even if these recommendations make it through the Committee stage, which I doubt, both Council and Commission would resist them featuring in the final text of the Regulation as they have no corresponding Article. The amendments concerned relate to driver/rider training, side visibility reflectors, roadside random spot-checks, technical examinations of motorbikes and liabilities in accident situations, and the harmonisation of driver licence schemes. There is very little Conservative MEPs can do about motoring-related proposals which are outside the scope of this draft Regulation but which are being considered by the governments of other Member States as national legal measures. In the context of this draft Regulation, we are simply not engaged in a discussion on national debates concerning the mandating of high visibility jackets for riders, the banning of older motorcycles from urban areas, nor are we discussing EU funded research on throttle and speed control schemes. These are all considerations which are completely outside the scope of this legislative proposal. Furthermore, picking up on other concerns constituents have expressed, there are no proposals on the table about mandating the sealing of the power train from the air box or relating to setting a diameter and aspect ratio for the rear tyre. It is already the case that motorcycle manufacturers are fitting ABS as well as traction control systems on high powered motorcycles, and this follows consumer demand. There is also strong political pressure to get the balance of interests right between riders, the industry, and safety, while not losing sight of improvements to motorcycle emissions. The overall cost benefit of ABS is stacked in favour of mandatory ABS for higher powered motorcycles. However, riders have been arguing for an ABS off-switch for certain conditions such as driving on loose gravel. This concern is almost exclusively relevant for dual use rides (off and on-road), and please note here that Enduro and Trial motorcycles will have a separate category (L3e) under the revised rules without mandatory ABS. Furthermore, when negotiating compromises, we will be asking the lead (or Rapporteur) MEP to consider proposing an off-switch for ABS for those PTW categories where ABS will end up being mandatory. Finally, there is political pressure in IMCO to introduce ABS on lesser powered PTWs, but we are resisting this as there is a lack of consistent evidence that this would improve safety for these types of motorcycle. Clearly, the IMCO Committee does not support putting an end to aftermarket sales of spare parts for repairs and improvements. Anti-tampering measures are intended to stop alterations to the vehicle’s power for safety purposes or to meet environmental performance requirements. These are currently limited to mopeds and motorcycles under 125cc producing less than 11kW. The Commission has now proposed to extend cover to all vehicles within the scope of the draft law and we are well aware that there is concern over the extent to which this may restrict the ability of after-market parts manufacturers to sell their products because of potential difficulties they may have in securing type approval, particularly for parts produced in small volumes. In any case, the European Parliament retains a right of scrutiny over any such future measures and it is absolutely not the case that the Commission will be able to design these technical specifications behind closed doors, nor is it in their interest, so drive train improvements or part replacements using aftermarket parts will continue to be allowed. Furthermore single vehicle approvals (SVA) will continue to be possible for those who tune their own motorcycles or modify their rides with parts, which if not designed to work together, require individual approval. Under the new proposals, after modification or tuning of the power train, a motorcycle must still comply with applicable technical requirements set at EU level (Article 18(4) of the Commission proposal). For the rest, the matter is largely left to national rules, which means riders and repairers will continue to be able to modify motorcycles as per the applicable rules in the UK. There are amendments tabled in IMCO calling for any modifications to the motorcycle to be checked by a competent authority (setting up national agencies to inspect emissions in particular), but I strongly believe these ideas will not meet with majority support, neither in the European Parliament, nor in the Council of Ministers. Indeed, in certain specific circumstances, there may be safety grounds for switching a motorcycle’s headlight off, such as when the sun is behind the rider and the headlight blends into the bright background or when the motorcycle headlight is directly aligned and in front of one of the headlights on a car or van (and stays aligned over the period the rider is being looked at by other road users), making the rider almost invisible. However, even in these circumstances, we are not at all convinced that there is clear evidence to support that the motorcycle is less visible to other road users. This depends on the precise colour and intensity of the bright background (the sun’s colour and intensity varies, as do other vehicles’ headlights in size, colour, glare and relative distance from the ground). If the blending is not a near perfect match, we believe that the rider would be more visible with his headlight on anyway. Overall, our position is quite clear that the benefits outweigh the drawbacks for this safety provision. The intention of OBD is not to affect the motorcycle’s behaviour, but to provide the rider with information that there is a malfunction in the form of a warning light. This could be developed into OBD systems which provide more detail on the type and severity of the malfunction, but we are against any limp-home functions that may activate unexpectedly while riding. If the malfunction is so serious that the motorcycle runs a real and imminent risk of being seriously damaged, compromising rider security in the process, a limp home function might be welcome, but our proposal would be that it activates only once the motorcycle has been brought to a standstill first. We are supporting OBD Stage (I) requirements but proposing to delete OBD Stage (II) from the draft Regulation because these would entail significantly higher costs for manufacturers which would be reflected on retail prices, without demonstrating a good return on investment in terms of added benefits. Furthermore, we understand that most PTW manufacturers already offer monitoring systems similar to what OBD Stage (I) would require, which may explain why some MEPs support the idea of bringing forwards the implementation date here (as part of Euro stage 4(5)). The Conservative MEPs have not tabled any amendment to that effect and will try to resist this to ensure all manufacturers can comply in time. I do hope you find the follow up email useful. Chairman of the Internal Market and Consumer Protection Committee. Thank you very much for this response. We would be extremely grateful if you could give us permission to publish your email in order to put a halt to the misinformation that is now circulating in the motorcycling community, especially here in the UK, although not exclusively. Overall we are very aware of the processes and have been trying (without much success, I might add) to explain to the motorcycle community that issues such as those proposed by the French government (Hi Viz, motorcycles over 7 years banned from urban areas) are NOT within the EU Commission’s remit, nor are being considered by the IMCO. What did concern us, as we reported, was the sheer scale of amendments and our concern that what was intended as a simplification of regulations had taken on a new life within the IMCO Committee. Just to be clear, we have been very supportive of your position and amendments perhaps with the exception that we still believe that market forces should prevail with regards to technology, specifically ABS, because the industry has already developed ABS and the vast majority of motorcyclists actually believe that ABS is beneficial. With regards to a switch, motorcycles such as Adventure Traillies (e.g. BMW GS etc) already have a switch, thus we felt that the discussion was irrelevant, simply because it was never mentioned in the Commission’s proposal, which ACEM pointed out. Equally the industry has introduced a voluntary system of AHO, accordingly the vast majority of motorcyclists agree with the use of AHO. Whether these technologies actually reduce casualties is questionable. I am working on a study of motorcycle fatalities in Northern Ireland with the Road Traffic Accident Investigation Team and although there is a lot more to do before I complete the research, findings so far indicate that the vast majority of fatalities are simply due to behavioural issues by both the rider and car/van/truck drivers. However, your email has undoubtedly given us a wealth of information which we believe would be extremely helpful in allaying the concerns in the motorcycle community. The answer is, it’s just not that simple, because at the moment for example the trilogues are taking place – the trilogues are meetings between the parliament representatives, the Commission and the Council – which represents the member states (or rather within the Council the members states are represented). Once these trilogues have thrashed out all the issues including the infamous article 18a and other issues relating to the proposal, it then needs to go to parliament. However given that this is the first piece of legislation post Lisbon Treaty, it has become highly political – especially where the Delegated Acts are concerned. As an example of the Delegated Acts, everybody seems to be getting their knickers in a twist about the possible “ban on choppers” which has been completely taken out of context. The Commission wanted to have a U turn and slalom test for ALL motorcycles, scooters etc but gave the unfortunate example of extreme chopper style to justify the test. However, I am not aware of data that would show these as being over-represented in accidents- so designing a Type Approval test that would apply in 99.99% of cases to vehicles not prone to being a problem, would not be cost-effective and in my view difficult to justify, in any case all this is part of a discussion paper that the Commission put forward as a draft and asked all the stakeholders for their opinions so nothing is set in stone. Apart from that, the Member States are jittery about the power that they have effectively given the Commission through the Lisbon Treaty – in terms of allowing the Commission freedom to decide what goes in the Delegated Acts. Of course the fact that the Member States signed the Lisbon Treaty, makes you wonder if they actually read the document before signing! The word out in Brussels is that it is highly likely (but don’t hold me to this) that the proposal will go to a second reading or even be shelved – because of this power struggle between parliament and the Commission – definitely nothing to do with a Rider’s Rights organisation writing to MEPs. My personal view is that motorcycles were chosen because it a small enough industry to pick on and because in part it is effectively lagging behind the automotive industry, especially in areas of environmental issues and needs some form of regulation. The initial aim of reducing regulations from 13 to 4 is a good idea, it just all got lost in the “good intentions” or otherwise of the Commission officials and the zealous MEPs. 3) will ABS be a good thing (given that the Commission has clearly stated that they don’t have any objections to the manufacturers putting switches to turn the system off, on motorcycles), the answer is – yes in some cases – but not all. What it will probably do is to force the industry to lower their prices for bikes with ABS as the motorcycles with ABS have artificially high prices. In any case Enduro and Trial bikes are exempt from this, so won’t be affected. 4) will AHO make a difference in reducing casualties – I doubt it, but it’s already a voluntary measure by the industry anyway, and the overwhelming majority of riders switch on their lights, so I can’t see the difference. 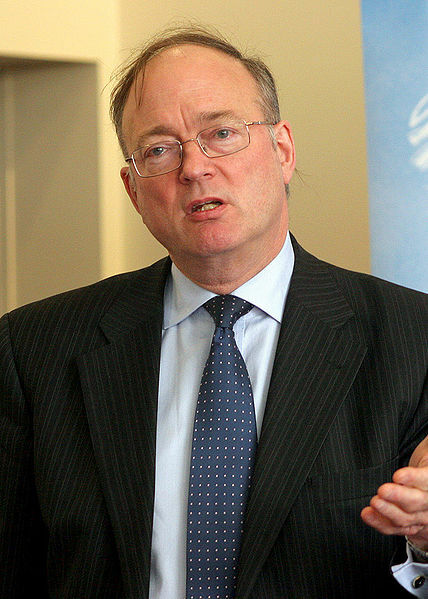 5) will this proposal if it becomes a regulation, change production – I doubt it. I think people seem to believe that the European motorcycle industry has a monopoly on the EU market, they don’t and as the Indians (e.g. see the Apache 180 – which has ABS and costs around £1000 in India) and Chinese improve their technology, they’ll sell their bikes in the European market and I suspect will probably end up buying European motorcycle companies anyway. 6) will the aftermarket be affected – I doubt it. The amendment (18a) to have substantial modifications checked by MS authorities, added in by Kirsten Westphal (MEP) needs to be clarified and apparently the Commission would need to provide a relevant list, but that is not the same as modifying your motorcycle with approved aftermarket parts and there is nothing in the proposal or subsequent amendments by the MEPs to suggest that this would not be possible. However, we need to wait and see with regards to article 18a. You could however consider article 52 which refers to competition bikes or rather components or technical units for road racing motorcycles (i.e. the barring of the sale of duel components) and prohibits the use of these components for normal motorcycles – but that is a red herring really and where people are freaking out about the ban of using parts from the throttle to the rear tyre because it’s not going to affect the overwhelming majority of motorcycles and aftermarket components. What has been proposed (which has been misinterpreted) are potential anti-tampering measures for motorcycles that are already restricted, with the exception of extending these measures to the new A2 category – however the Commission representative informed me that as and when the rider wishes to move up to the A category then he/she is perfectly entitled to de-restrict their motorcycle. In any event, we have argued to the Commission that there is insufficient evidence that tampering with the power outlet etc is a major problem. I even suggested that they best way to stop moped riders from tampering to increase speed, would be to increase the threshold from 45kph to 55 or 60 kph, I explained that in cities like Rome and Madrid, there appears to be a problem with tampering, because the low speed is actually making the mopeds dangerous in traffic. He didn’t think that this suggestion would be accepted. TRL (UK Research company contracted by the Commission) has done a study on anti-tampering which proved absolutely nothing, so it’s anybody’s guess whether these measures end up in the final document. I guess that the ordinary rider that goes out and buys his R1, GSXR, or whatever, won’t see the difference, what he will see is a label which tells him the CO2 emissions. Apart from that if you consider all the technology that the manufacturers are cramming on these bikes already, which are being sold as an advantage to riding ability, there is nothing that I can see that will change anything. Even the French will now finally get rid of the 100 bhp ban. I appreciate that it’s not easy, but I don’t know how to make it any simpler. I am now beginning to wonder if Sunday’s protest (which I attended) was protecting motorcycling or the manifestation of a generally aging crowd’s fear of change…. Another excellent article posted by Back Road Rider and food for thought! “Then there’s the engineering. I am an automotive engineer. I’m dedicated to forming new and creative ideas that produce, better, safer more economic vehicles. I bet 90% of the propel protesting today also drive cars fitted with things like Air Bags, ABS, CBS, Traction Control, Stability Control, Active Suspension, Collision Avoidance, On Board Diagnostics, Daytime Running Lights have vehicle management systems that record the drivers actions and that meet the latest emission standards. So what’s the problem when it comes to fitting these devices to motorcycles. Transferred to bikes some of this stuff will make them safer, more manageable and hey even more fun to use. They simple won’t affect our freedom to ride the machine anywhere in Europe. There’s the argument over things being mandatory, but that applies to cars too. Strange didn’t notice the protest over say ABS being mandatory on cars. I don’t like things being mandatory either but with twenty-seven countries involved there is little choice, back to the “lets leave the EU” argument perhaps. The European Union proposals include banning motorbikes from cities, making the rider responsible in an accident with another vehicle if they weren’t wearing day-glo colours and making all bikes fit Euro specification parts, which MAG claims will put local garages out of business. Jolyon Lawson, chairman of East Yorkshire Mag and vice-chairman of the national Mag. The new rules say bike owners will only be able to use manufacturer approved parts on their vehicles. At Right To Ride EU we like well written and relevant articles and here is one on the regulation proposals from our friends over at Back Roads Rider. Worthing, England – Is it good news or bad news? For once I really don’t know! This week the UK Parliamentary Under-Secretary of State for Transport, Mike “the bike” Penning MP launched a Consultation. 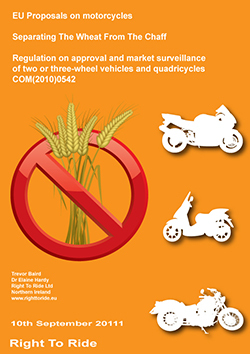 Yes folks it’s on the European Union (EU) proposed regulations for the type approval and market surveillance of 2 and 3 wheeled vehicles and quadricycles.